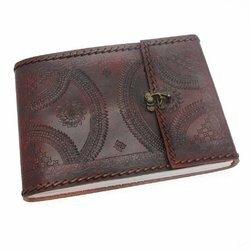 We are deal with the wide range of leather journal. This suede leather journal is made up of sheep/goat leather and contains 100 sheets of mill made paper. The leaflets are refillable & journal can be customized to any preferable design. Colors available: Blue, Red, Brown, Black & Chocolate. Size Available(In Inches)	: 6" x 9"
We are amongst the most reputed names in the industry, offering Suede Leather Journal. A perfect way to record memories or take notes, our suede leather diaries are available in variety of designs and colors to choose from.